A clinging clingfish at Sodwana Bay!! 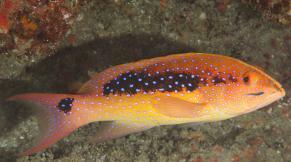 A juvenile lyretail rockcod, Variola louti, with a clingfish below its eye. Photograph by Sally Polack. Yo, Sally does it again! Sally Polack, an avid veteran scuba diver but novice underwater photographer, was diving with her husband Dennis and John Dench, both experienced photographers, and she shot a lovely photo of a juvenile lyretail rockcod (Variola louti). Back at the house, we were downloading the dive’s photographs and noticed something resembling a leech on the cheek of the lyretail. When the photo was enlarged, we were much surprised to see a long, slender clingfish! Sally’s photo is a notable discovery as it shows a clingfish species that we have not seen before (elongate body with a dark brown mid-dorsal stripe flanked by two turquoise stripes from snout to end of tail fin). Clingfishes (Family Gobiesocidae) have the pelvic fins modified to form a sucking disc with which they hold onto longspined sea urchins, crinoids (featherstars), sea whips, branching corals, seagrass blades and the substrate. Sally’s photo is the first evidence that western Indian Ocean clingfish may also act as cleaners. Some species in Australia have also been found to act as cleaners and have been seen attached to larger fish removing their external parasites. Some years ago, when the former Collection Manager at SAIAB, Andy Bentley, was helping us collect fishes in Mozambique, he caught a clingfish that had attached to his wet suit. But we thought that incident was some kind of clingfish aberration, as no one had ever reported this behaviour before. Sally’s previous notable discovery at Sodwana Bay was her discovery of garden eels (Heteroconger hassi) in 2000. Despite thousands of dives at Sodwana, no one had noticed, recognized or reported garden eels at Sodwana. After Sally’s discovery, colonies of this bizarre, plankton feeding congrid eel were found at many of the Sodwana reefs. Japie Kamminga of Stilbaai sent in another new distribution for a juvenile butterflyfish for the second year running. He caught a pearly butterflyfish Chaetodon madagaskariensis juvenile in a fish trap. This WIO butterflyfish was known on our coast from Somalia to Algoa Bay. It is found on coral rocky reefs and feeds on benthic invertebrates and algae. Pearly butterflyfish do well in aquaria. The juvenile pearly butterflyfish Chaetodon madagaskariensis photographed at Stilbaai by Japie Kamminga.